oh wow! I love the use of crochet and beads. Amazing headpins! 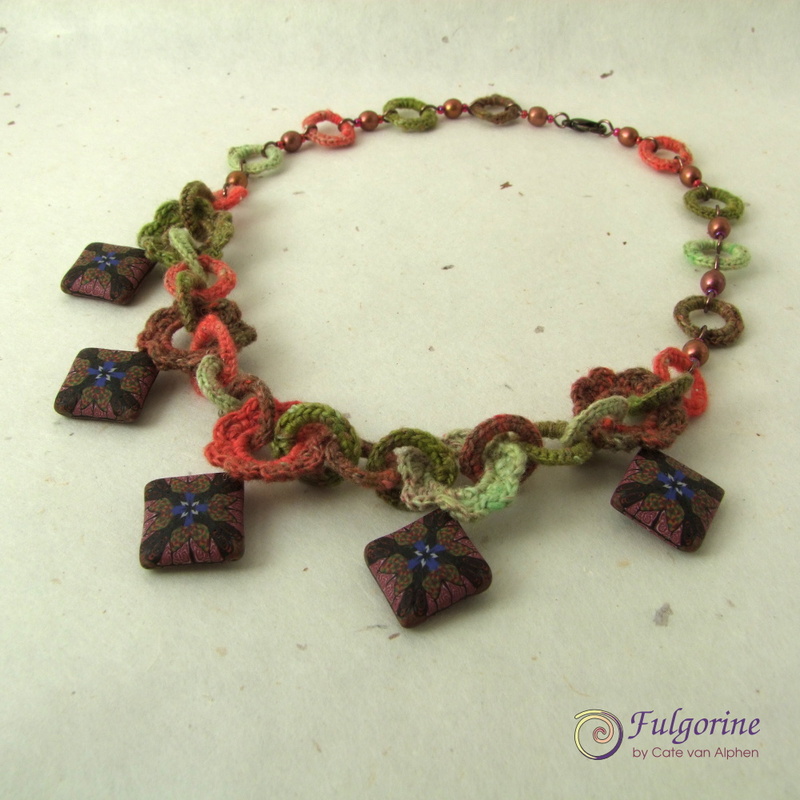 And I love the creative way in which you used them, the combination of yarn, metal and polymer is really unique! Wow! Just wayyy cool! I don’t think the flowers are too jumbled. The necklace has wonderful flow! Maybe I’ve spent too long looking at it. Thanks. Your creations are so unique!! Beautiful work! I love your polymer clay headpins!! They’re beautiful. And I love the mix of crochet with the clay-very unexpected! They’re fantastic! Love the full crochet necklace, what a brilliant way of interpreting the theme! Your pc headpins are wonderfully intricate. 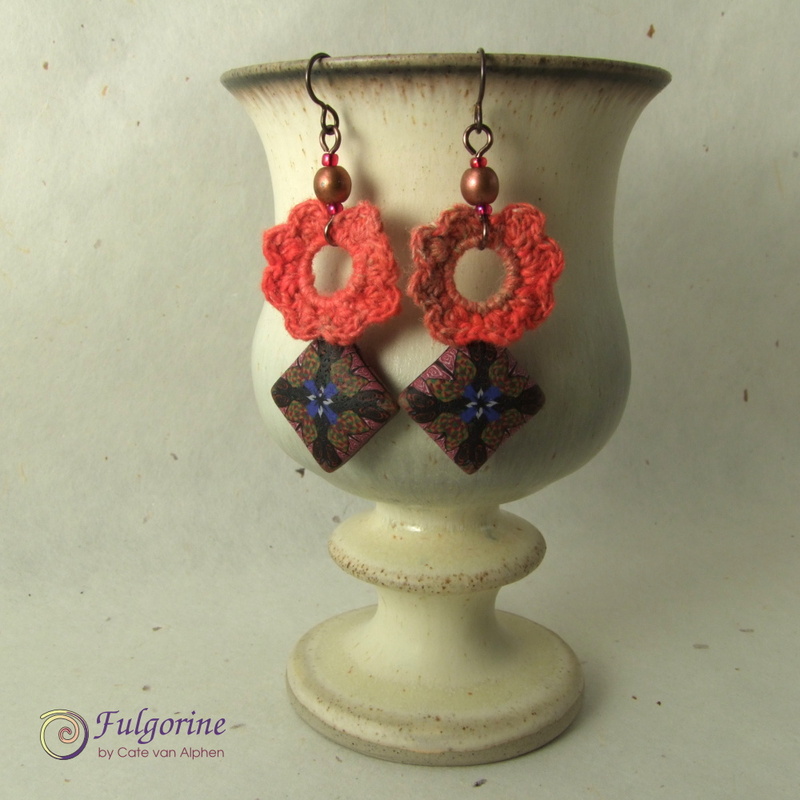 And the way you combined them with crochet in your jewelry is so unique. Whoa. Fibers. I tip my hat. Fibers elude me. Your polymer headpins, however… they are gorgeous. And almost make me want to do canes. Almost. ( I did canes once and was scarred for life. Its not my thing). I respect the cane! Brilliant! I love the combination of textures and colors, and such a creative use for the headpin wire. Thank you for playing along with us! Very clever! I enjoyed reading your process and that you experimented with the crocheting on the wire, which is a completely different approach than I’ve seen before this. Thanks for participating and for reading AJE! Now that’s an approach I don’t think I’ve ever seen before and you certainly were ambitious with your creations. Very nice! Oh my, I love what you have created! The crocheted flowers are a wonderful idea and are so unusual! I love the necklace that you made. 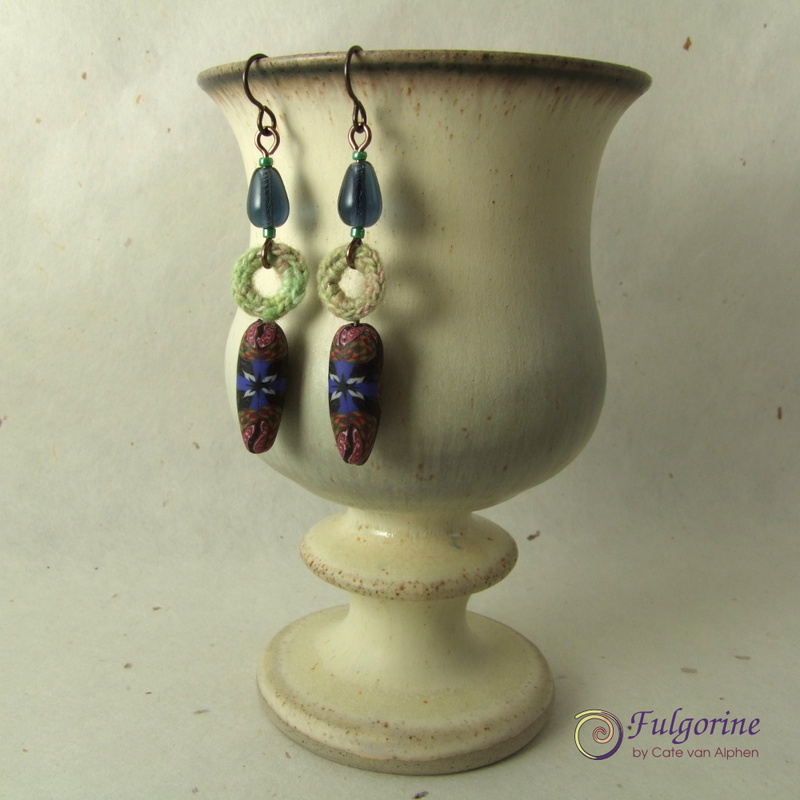 The soft and colorful crochet beads are beautiful and a wonderful contrast to the dark and hard headpins. Well done! So unique! Love the use of the crochet! Love the crochet…I crochet..hadn’t thought to use it that way. Great job! Just love the combo of the crochet and the headpins. Great mix of materials here Cate and lovely end results. Wow, Cate, I love what you made and I’m not sure how you can crochet that tiny but wow, love the flowers! Thanks for playing along! It just takes fine yarn and a small hook 😉 It was a fun challenge. 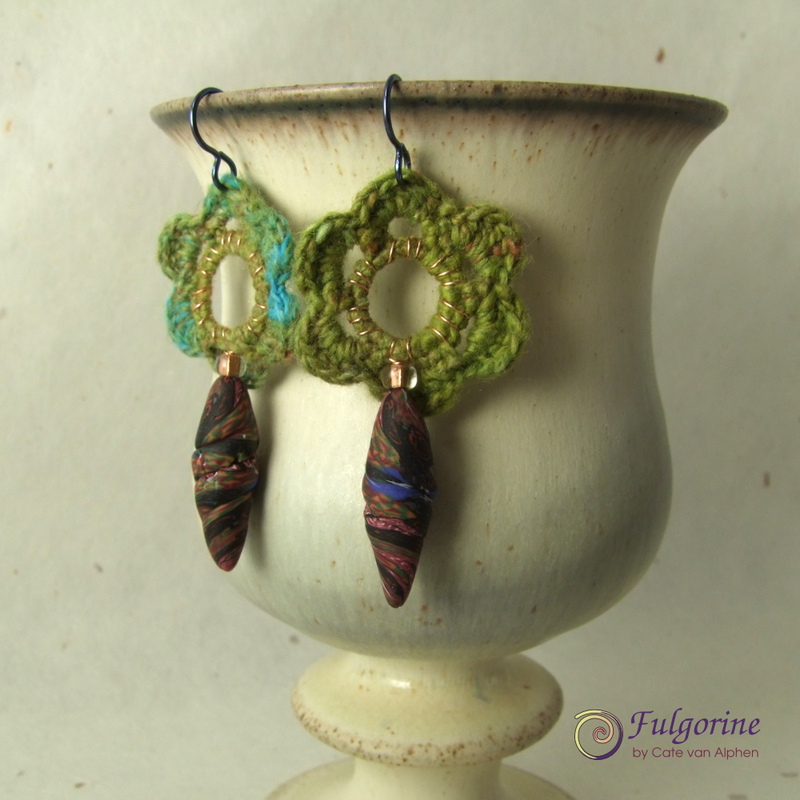 Your designs are totally unique and I love the crocheted jump rings! Those pc pieces are jazzy.